Firing a missile over Japan was a tactical error by the Supreme Leader of North Korea. It is one thing to play bluff with the US but to tease Japan in this way is to insult their culture and heritage. They have awoken the giant. Economically, the furious activity to ready themselves to defend their people will strengthen them – as previously predicted in our recent blog “Will there be a war between North Korea and the USA?”. Last financial year Japan was Australia’s third-largest trading partner and second-largest export market. Japan lacks many raw materials such as oil, coal, iron ore, copper, aluminum and wood. In 2015-16, Australia’s major merchandise exports to Japan included LNG, coal ($11.2 billion), iron ore ($4.7 billion), beef ($1.8 billion), and copper ores and concentrates ($1.4 billion). Imports to Japan jumped 16.3 percent year on year to July 2017. Australia grew its exports by 36.1% – including raw materials +30.7% and Mineral fuels expanded by 25.9 % (of which LNG is half). Whilst the world waits for a resolution of the North Korean Missile Crisis, instability is one thing we can count on. We now expect growth in raw materials into Japan (including those) supplied by Australia. Pythagoras provides recommendations on dozens of companies which could stand to benefit from such a change. They include big and small mining companies as well as the “pick and shovel” companies who provide services to mining companies – what we call the infrastructure builders. A listing of those companies and their 5 year returns are located HERE. Thus the US-North Korea situation is a controlled firestorm at present, with lots of impacts to come from it as it reshapes a lot of future International policies and practices. What we can draw from all of this is a long period of uncertainty and world insecurity, as new powers try to assert themselves. 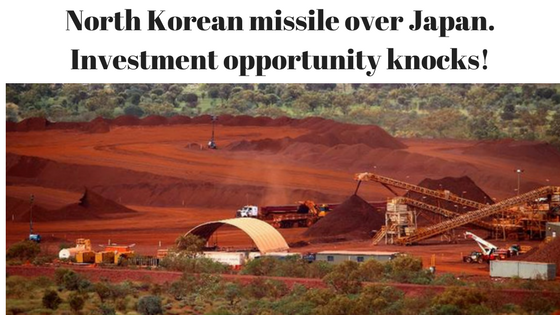 We also know the likely beneficiaries from this act are Australian Mining companies and Infrastructure Builders which we specialise in providing recommendations for. Our blog this week on Programmed Maintenance Bonanza gives a practical example of how you can use Pythagoras to make money. We recommend a sell when the market/stock is at risk of going down, or no-where. At these times we recommend investing in cash and await the buying opportunity. When the market/stock is less risky, and it’s going to go up, we reinvest to profit. Don’t be the last to know – get ahead of the crowd using Pythagoras Investment Timing Indexes. Our website has all the information to show you how Volatility can be utilised to alleviate the tension and improve your life when investing, especially when the going is hard.